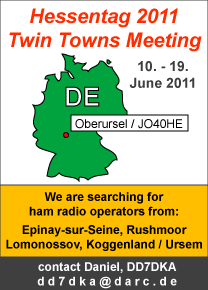 In 2011 during the state event "Hessentag" (June 10th - 19th 2011) in the city Oberursel, Germany, we want to meet all of our twin towns via ham radio. Oberursel has four twin towns, Épinay-sur-Seine (France), Lomonosov / Oranienbaum / Ломоносов (Russia), Rushmoor (England) and Koggenland / Ursem (Netherlands). We are looking forward to meet ham radio operators from all of these regions on air. If you are from one of the twin towns or living near by please contact us. We are searching for ham radio operators and local ham radio clubs / radio societies for this event. You can send a E-Mail to Daniel, DD7DKA, public relations officer, with your contact details (Name, Call, E-Mail). ham radio, band / frequency information will be published in time.